Photos of a week-long drive from Aqaba to the Syrian border via the Kings Highway. One of the towers guarding the walls of Montreal Castle. The castle was built in 1115 by Baldwin I of Jerusalem during his expedition to the area where he captured Aqaba on the Red Sea in 1116. Originally called 'Krak de Montreal' or 'Mons Regalis', it was named in honour of the king's own contribution to its construction (Mont Royal). After capturing Jerusalem in 1187, Saladin besieged Montreal. 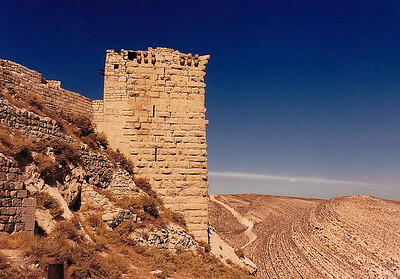 Because of the steepness of the hill site, Saladin was unable to use siege engines, but after almost two years the castle finally fell to his troops in May 1189. 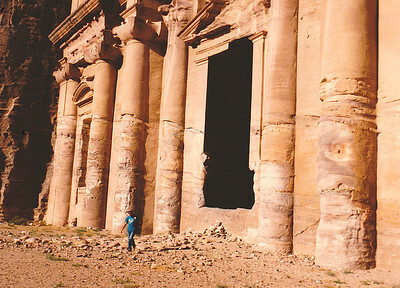 The ruins, called Shoubak or Shawbak in Arabic, are located in modern town of Shoubak in Jordan. 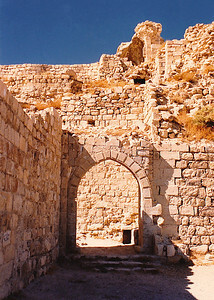 A gate penetrating one of innermost of the three walls of the ruins of Montreal Castle (Shoubak). 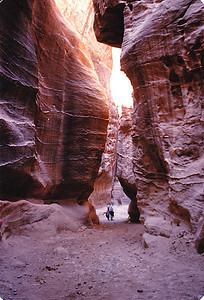 Petra's eastern entrance leads steeply down through a dark, narrow gorge (in places only 3 - 4 m (9.8 - 13 ft) wide) called the Siq ("the shaft"), a natural geological feature formed from a deep split in the sandstone rocks and serving as a waterway flowing into Wadi Musa. 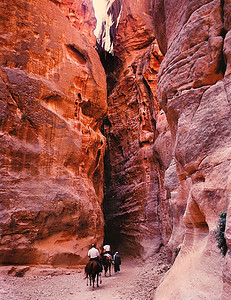 Petra's most elaborate ruin, Al Khazneh (popularly known as "the Treasury"), is hewn into the vividly-colored sandstone cliff. Note the Greek and Roman architectural influence in the colonnade of the façade. This structure served as a backdrop for the final scenes of "Indian Jones and the Last Crusade." 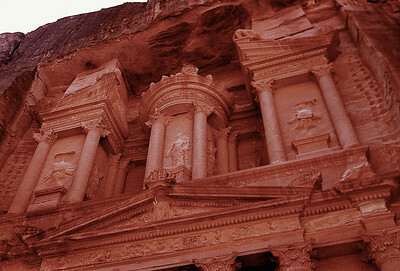 Close-up of the façade of Al Khazneh (popularly known as "the Treasury"). 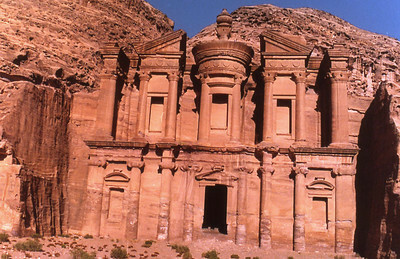 The Monastery, Petra's largest monument, dates from the 1st century BC. It was dedicated to Obodas I and is believed to be the symposium of Obodas the god. This information is inscribed on the ruins of the Monastery (the name is the translation of the Arabic "Ad Deir"). Close-up of the façade of the Monastery. 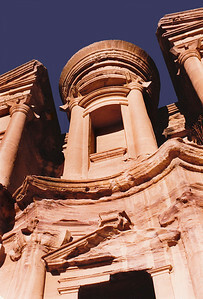 Close-up of the lower third of the façade of the Monastery, showing the effects of wind-blown sand that abraded the soft sandstone into which the structure was carved. My fellow geologist Walt Venum gives a good idea of the monumental scale of the building. 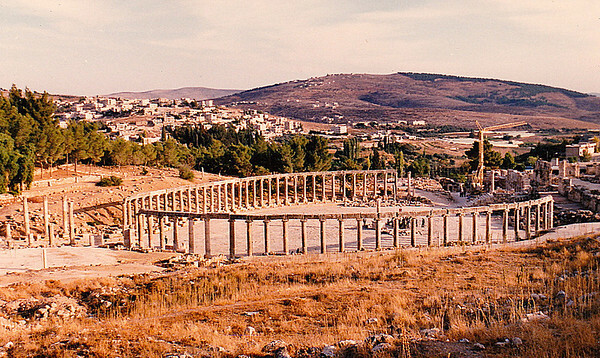 The South Theatre of Jerash. This theatre contains 32 tiers of seats, the lower rows of which are numbered in Greek, and could presumably be reserved. It could accommodate obout 4000 people. An inscription on the wall at the right ao the stage tells that a Statue of Victory which once stood there was presented by a non-commissioned officer of the army of Titus in A.D. 70, and cost 3000 drachmas. 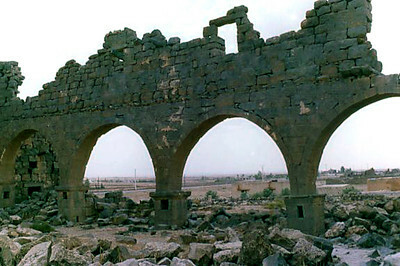 Intact arches of the West Church, Umm el Jimal. 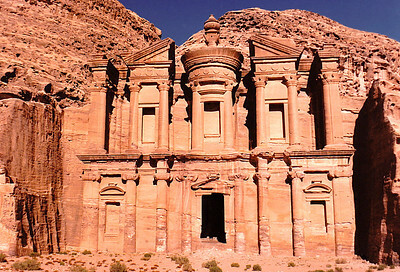 After the Romans turned the Nabataean Kingdom into their Provincia Arabia, they also occuppied Umm el-Jimal. In A.D. 180, the Roman imperial authorities constructed a wall and a gate, a large reservoir and the Praetorium. During the 4th century A.D., in response to the rebellion of Zenobia of Palmyra, Roman armies allied with the Arab Tanoukhid Federation restored order in a destructive military campaign. At Umm el-Jimal the civilian settlement was replaced by a military garrison stationed in a purpose built fort, the early castellum, which was part of the general fortification of the Roman frontiers at the time of Diocletian and Constantine. Besides this castellum structures on the sight included the Great Reservoir, the Praetorium and a small temple. A gradual transformation from a military station to a civilian town began as Roman imperial power waned and was then replaced by the Byzantine era. 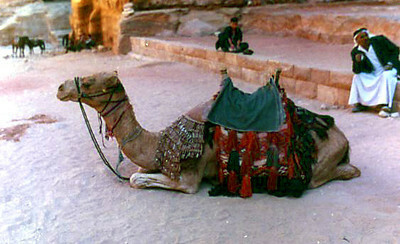 From the 5th to 8th centuries, Umm el-Jimal became a prosperous rural farming and trading town. During this period of prosperity, many residents converted to Christianity resulting in an explosion of church construction: Fifteen churches were built in the late 5th and 6th centuries. 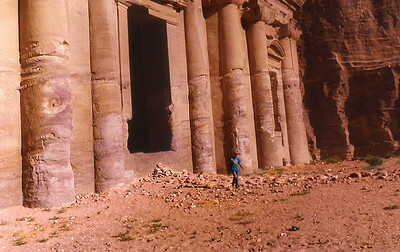 The population of Umm el-Jimal likely grew to between 6,000 and 8,000 people during this time. Evidence of this culture is found throughout the site in the form of Christian symbols on houses and churches. 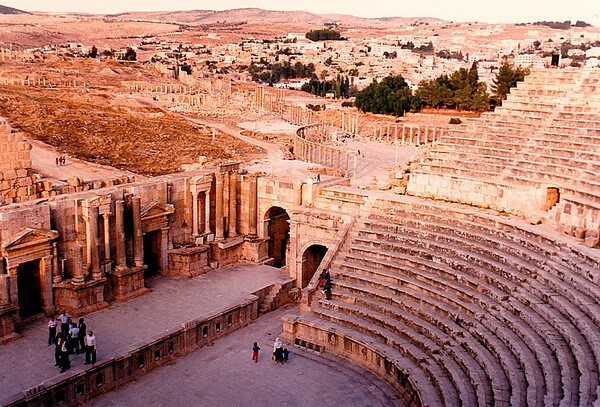 Paradoxically, Umm el-Jimal's age of rural prosperity came after the strictures of Roman occupation were lifted. Umm el-Jimal’s local agricultural culture continued after the Muslim conquest and under the Umayyad caliphs during the 7th century. Though the site decreased in size, some new construction took place. This construction included private houses, possible conversion of several structures into mosques, and the remodeling of the Praetorium with frescoed walls and mosaic floors. 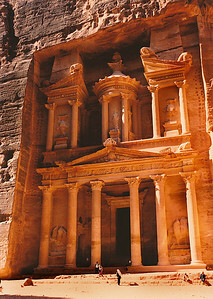 Around this time the population decreased, especially after an earthquake hit Umm el-Jimal in A.D. 749. The ruin of the Roman Praetorium. 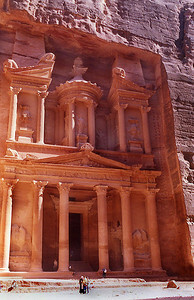 After the Romans turned the Nabataean Kingdom into their Provincia Arabia, they also occuppied Umm el-Jimal. In A.D. 180, the Roman imperial authorities constructed a wall and a gate, a large reservoir and the Praetorium. During the 4th century A.D., in response to the rebellion of Zenobia of Palmyra, Roman armies allied with the Arab Tanoukhid Federation restored order in a destructive military campaign. At Umm el-Jimal the civilian settlement was replaced by a military garrison stationed in a purpose built fort, the early castellum, which was part of the general fortification of the Roman frontiers at the time of Diocletian and Constantine. Besides this castellum structures on the sight included the Great Reservoir, the Praetorium and a small temple. A gradual transformation from a military station to a civilian town began as Roman imperial power waned and was then replaced by the Byzantine era. 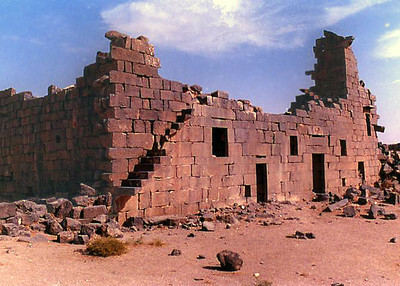 From the 5th to 8th centuries, Umm el-Jimal became a prosperous rural farming and trading town. During this period of prosperity, many residents converted to Christianity resulting in an explosion of church construction: Fifteen churches were built in the late 5th and 6th centuries. 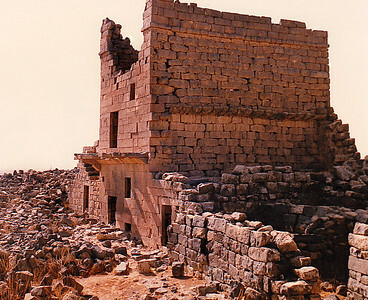 The population of Umm el-Jimal likely grew to between 6,000 and 8,000 people during this time. 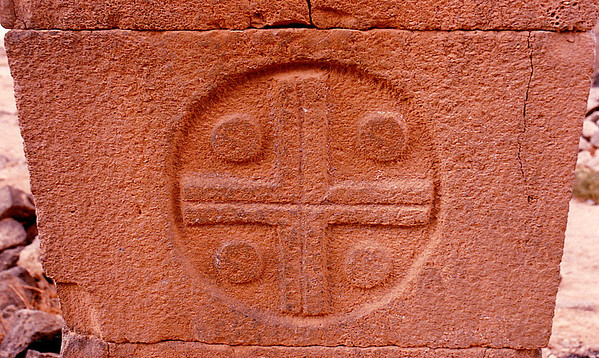 Evidence of this culture is found throughout the site in the form of Christian symbols on houses and churches. Paradoxically, Umm el-Jimal's age of rural prosperity came after the strictures of Roman occupation were lifted. 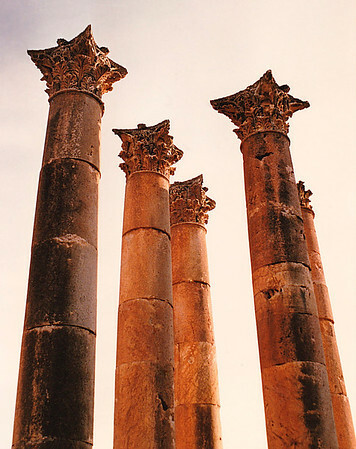 Umm el-Jimal’s local agricultural culture continued after the Muslim conquest and under the Umayyad caliphs during the 7th century. Though the site decreased in size, some new construction took place. This construction included private houses, possible conversion of several structures into mosques, and the remodeling of the Praetorium with frescoed walls and mosaic floors. 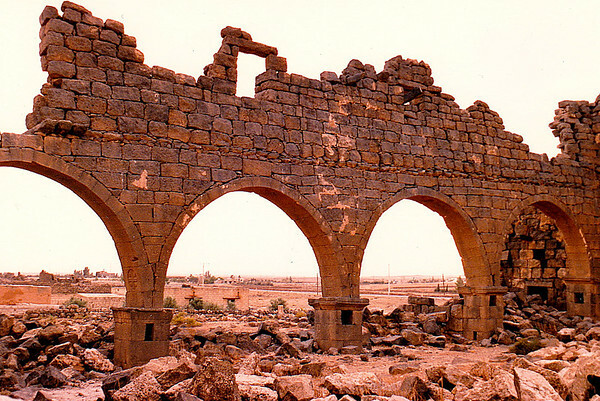 Around this time the population decreased, especially after an earthquake hit Umm el-Jimal in A.D. 749. A Byzantine-style Christian cross inscribed on a masonry block supporting one of the arches of the South Church. 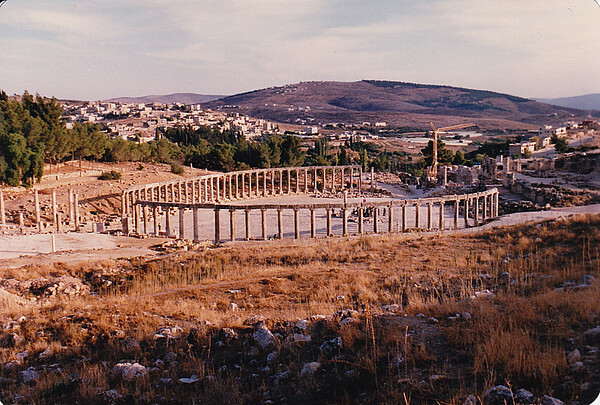 Umm el Jimal, Jordan.